1. To make the okonomiyaki batter, put the eggs in a bowl and add the dashi. Whisk together, then slowly add the flour and baking powder to form a smooth batter. Season with salt. 2. Add the cabbage, beansprouts, mussels and prawns; gently fold together. Take a non-stick pan, around 22cm in diameter, pour in the oil and set over a gentle heat. When hot, pour the okonomiyaki mixture into the pan and cook over a medium-high heat for 5 minutes, or until golden. Keep checking to make sure that it does not burn. 3. 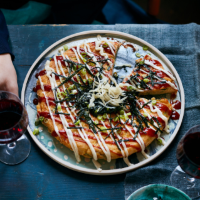 Using a spatula, very carefully flip the okonomiyaki onto a plate, then quickly transfer back to the pan and cook for a further 5 minutes. Test that it’s cooked by inserting a thin knife into the centre – if there is batter left on the knife, cook for a further 2 minutes, then test again. When the knife comes out clean, it’s cooked. Transfer to a serving plate. 4. Mix the tomato ketchup and Worcestershire sauce in a bowl then transfer to a small piping bag. Put the mayonnaise in a separate piping bag. Squeeze the tomato ketchup mixture in a zigzag all over the okonomiyaki. Repeat with the mayonnaise. Sprinkle the salad onions over the top, followed by the nori. Finally, place the sushi ginger in the centre and serve.